Seeing this sweet perching of morning doves is such a mixed blessing this morning. 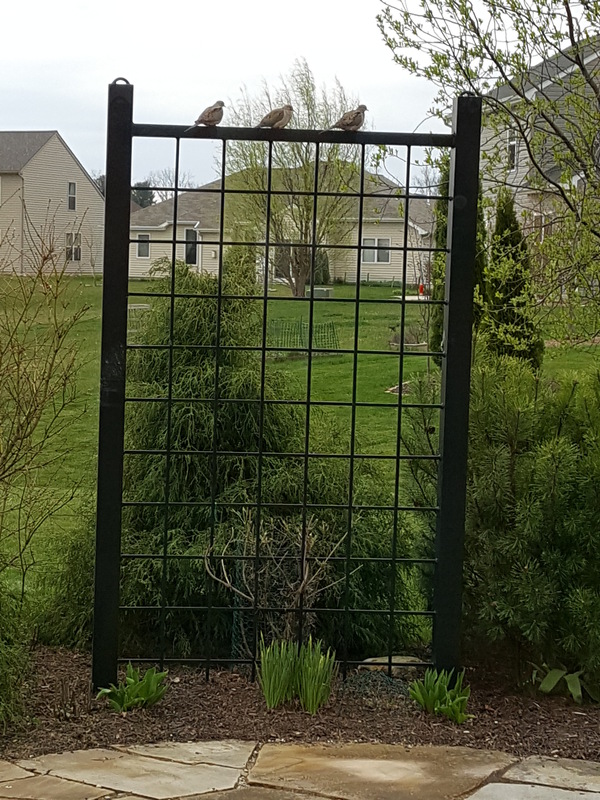 They are able to sit there because yesterday I was able to cut down the massive out branching of a clematis from lower on the trellis. Also washed the flagstone patio of dirt and some algae. I should have worn a mask for both projects. Acute sickness and violent convulsive episodes followed within the hour and at the beginning of a sweet Skype call with my hubby’s son and family. So sad. However, the experience was diagnostic in that I am dealing with biotoxin illness now more than anything else. Also I am tolerating targeted treatments for this for the first time in 4 of these 5 1/2 years of illness. Lord willing, I am going to get well! Gentle Reader, let the morning doves portray the hope that I have each new day in my Lord and Savior, Jesus Christ. No matter what may come, our God reigns! Very fitting the week before Easter don’t you think? I was watching an interview of actor Jim Caviezel who portrayed Jesus Christ in Mel Gibson’s movie Passion of the Christ. Jim has a powerful testimony of the physical trauma he endured during the making of that film. The movie came out in 2004 when I was in the beginning stages of divorce after my former spouse left me. I was devastated. Also within that year my grandmother and youngest brother had died, I lost my home, I had to change churches to begin the healing process (distancing me from my support system), my mother was diagnosed with lung cancer and underwent a serious surgery out of State, I lost my job, and had to store my things in 5 places while I began the first of what would become 5 moves of residence. One of these was after a condo fire which displaced me into a temporary apartment with only the clothes on my back for a time. Talk about suffering! Still this was nothing compared to what my Lord had suffered on the cross for my salvation. But I tell you, I simply could not watch that movie during that time in my life. I was too traumatized. It would just be too painful on too many levels. This week marks the 5-year anniversary of when I first started having wretched seizure attack episodes on a daily basis. I had gotten sick with a biotoxin illness for 6 months before then when an “alternative” treatment modality triggered the onset of seizures. (These continued today although gratefully the pattern is changing some again and this could become a good thing.) The suffering with these often violent convulsions has been tremendous. Never would I have imagined such a terrible, terrible illness. (See them here.) Even the tumultuous years around 2004 do not compare to what I have endured more recently. Even those who agonized with me during the various aspects of the stress 13 years ago do not compare to what my beloved husband Steve has endured with me during this illness. Suffering of this magnitude brings hell to earth for a part of every day. There are other periods of time that I would characterize as suffering: the incidents of abuse in my childhood. Some were sexual, others physical beatings, and several involved satanic rituals. All were profoundly damaging and required years of help, love, and the healing grace of our Lord, Jesus Christ to overcome. The abuse kept my mind, body, and emotions trapped in various ways for decades affecting my ability to function as an adult woman. Somehow I did find my way out when I found Jesus Christ as Lord and Savior; eventually the pain, the “suffering” largely went away. Self-destructive habits and negative thought processes faded. Forgiveness and healing took its place. I became more whole, interestingly surging even now to a new level of peace as the seizure attacks lessen. Suffering from abuse no longer troubles my spirit. The Lord doesn’t waste anything in His plan for our lives. After 2006, I got to experience a magnificent restoration from the “years the locusts had eaten.” (Joel 2:25) For example, the insurance settlement from the condo fire (where I was renting an apartment) ended up paying for beautiful décor in a condo of my own where I could rebuild my life as a single woman. Flash forward to more recently and I wrote here of the blessings that have come despite enduring a serious illness including meeting all of you through this blog! And all that childhood sorrow gave me a compassion for others that has served me well caring for others for decades as an occupational therapist. Despite my suffering, I am grateful that my Heavenly Father and Husband has allowed me to see His hand, His plan that has masterfully created goodness from the suffering He ultimately allowed for His glory. I now believe it was all for my good too. Collage art wall mural in the hallway of my condo with a self portrait too. And what about the more contemporary definition the word “passion?” The connotation of emotional, physical, sexual energy? Let’s just say there is much in my life now to be passionate about in having a wonderful husband (my “intended beloved”) who loves the Lord and me too. Then there’s my love of growing things in the garden (from my mom) that has kept me moving forward on my worst of days in addition to my best of days. I love digging in the dirt! Perhaps most importantly is my passion to champion the calling of the Holy Spirit when He compels me to: serve someone, encourage someone, love someone, share the hope found in Jesus Christ with someone. When I hear the call of the Holy Spirit moving me in a particular direction, I move forward with a razor-sharp focus that consumes whatever energy and resources are available to me at that moment. Whether it is in the middle of the night making my husband’s lunch for work the next day or baking cookies (despite a terrific headache) for that service dude who is having a really, really bad day. Me and my Lord getter done! This I have come to know: that if the Lord calls, He empowers us to respond. That is what passion is all about, good or bad. And guess what? He made the suffering, all of it, good for us on Easter morning. How about if we keep this in mind the next time he calls? 2 Lord, hear my voice. and with him is full redemption. Indeed He did redeem the nation of Israel as well as those of us adopted as sons, daughters into the nation of Israel. When we stress about the sufferings of our days we can remember that the Lord is with us, redeems us, and will come again in glory for us all because of what happened one Easter morning long ago . . . . These words encourage me during the most wretched of nights, which come every night. These words encourage me as I witness the life that has drained out of my brother’s body since his stroke this past weekend. These words encourage me as I ponder all of the loss and heartache during my half-century on this earth. These words encourage me as I see His grace and mercy in the loving eyes, the comforting touch of my intended beloved who loves me so. These Words are the Living God made real in my heart; transcending this life and drawing me to my life everlasting with my Savior. Because of Him I can see the blessings around me which hint at the life, the hope beyond. No matter where you are or what life is handing you, Gentle Reader, be assured that His love extends to you too. Easter Sunday is a celebration of the Lord’s perfect love. He came from the utopia that is heaven to live as a pauper, suffer a tortuous death, and returned in glory when no one was expecting it. We would not and can not do what He did for us. And as we believe in the living sacrifice of the Lord Jesus Christ, we are redeemed. Sorrow is replaced with joy from deep within our hearts. All things are made new. While my “outer man” is wasting away, my spirit is renewed day by day and will continue forevermore. In the wee hours of Christmas morning, it is. My body isn’t happy and my heart feels a little smaller than usual. I wonder when this or that will change: when the prayers will be answered? Sadly, some did not say hello when I made it to church for the first time in a month. Crying could be in the cards tonight, or at least a little pouting. And what would that accomplish anyways? I have so much goodness in my life, outside of this illness and its related difficulties. About these I have written time and time again. Why is it so easy to forget the blessings? The roller coaster of life when it gets complicated too easily pushes my focus off of what is most important again and again. Put the robe back on, take it off, no put it back on again as the sweat episode comes and goes; am I hungry or is it low grade nausea this time? Oh yeah, the tic attacks have started again. There is no end to this kind of thinking in my own strength. I go on about it here only to illustrate that even as a believer in Jesus Christ, I am tempted, taunted by the darkness of this world. Perhaps the difference between me and someone who does not believe will be what happens next. Others may attempt to “pull themselves up by their bootstraps” and cheer up with positive self talk. Still more will use a substance or dark distraction to erase the reality that can be so difficult to face. Those comforts will be temporary and fail to something else that must replace it eventually. Well this Christmas morning, these will not be me. I will turn somewhere else. But wait, can a baby born in a filthy village to a teenage girl and out of wedlock possibly comfort me in my anguish? Even if He spoke wise words, did countless miracles, and 500 people testified that he rose from the dead, does that have anything to do with me tonight? What if His life, death, and resurrection were perfectly predicted 500 or so years earlier without the benefit of the internet, does that mean anything for me or for you either? And if He was part of God, the three persons of the one entity that is “God,” does that mean that He had anything to do with me being created? So if He did create me, did He have really some purpose or plan for my life that included allowing me to get Lyme Disease? Guess what? The answers are yes. Jesus is for the “wounded.” Jesus is for this wounded woman who doesn’t feel so hot. Jesus is for those who do good and those who do not. Jesus is for those who think they are good but can never really be good enough because of our shared human condition: we are all flawed by sin. Jesus is for the sinner and those affected by sin in this fallen, imperfect world. Jesus is the answer now and always. And when I lift my eyes from my limited life and fix them on He Who is infinite, seek His forgiveness, claim that He is Lord, my eternal life comes into view. This trial of illness will give way to an eternity in heaven with Him: and there will be no more pain, weeping, or sorrow. Yeah God! How do I know this? He promised it in His Word! The answers are all in the Bible and the Bible is God, one and the same. How does that work? Finding the answer to that begins in a relationship with Jesus Christ, the Creator of all people, places, things, events, and spiritual entities. Some go to His Word first. Some cry out to Him before realizing Who is out there listening and waiting for them with perfect love. Some find Him through a person who knows Him and draws a bridge to the heart of Christ by his or her actions, tenderness, words. In the end, we can all find Him if we but seek Him. Don’t stop with that spiritual friend or influence either. He, she, or it will fail us at some point. Trust God to be perfect; just love people (spoken first by my former Pastor, Bill Hybels). Jesus will not, never, ever fail us. Jesus is for the wounded. He “knows” the cries of our hearts as He was also wounded physically, mentally, emotionally, socially, and spiritually too. He does care about our sorrows. He came to save us from the consequences of the sin of this world. If all this wasn’t true, He would have never left the heaven realms to be born into this world only to die a tortuous death on a cross. Would you leave paradise for me? Er, no.